Tattooer Greg Woodrow was born in Oshawa and has been living around this area all of his life. His father worked at General Motors and instilled a pride of Oshawa in Greg. As Greg grew older, he knew he wanted to become a tattooer and pursued that until he finally landed an apprenticeship. Greg has been tattooing for more than ten years. While capable of many styles, many people seek Greg out for his traditional or cover-up tattoos and he has developed a reputation of creating bold, long-lasting tattoos. 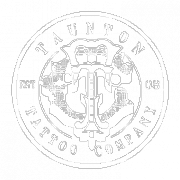 Carl joined the Taunton Tattoo Company crew in early 2016. He has been a tattoo artist for many, many years and he first started working in professional shops in 1993. His years of experience have made Carl incredibly knowledgeable and he is able to work with any customer to create a custom and quality piece. Carl used to work at the original Way Cool Tattoos on Queen St. where he acquired a following of customers. When not tattooing, Carl likes oi music, bull terriers, and movies. Dylan McCrae grew up in Oshawa and has always been drawn to tattooing and tattoo culture since he was very young. He always aims to push his abilities and knowledge of tattooing while maintaining a positive and upbeat attitude. His preferred style of tattooing is Traditional and Japanese, but he will never shy away from other styles. Jessie Darling (also known as Mrs. Wonderful) reigns from the Moon Kingdom, and no one is surprised with her out-of-this-world style and personality! Jessie has been working at Taunton Tattoo Company for 4 years now and enjoys every minute of it! She is the sweetest of all peaches and will keep you smiling from start to finish with your body piercing experience! Jessie will teach you the “do”s and the “don’t”s for aftercare and is always more than happy to help you out during your healing process!! Jessie’s favorite piercings are bridges and conches just because they are sooo dang cute!! Jessie Loves puppers, kitters, vintage dresses, anything pinup, and of course Mr. Wonderful. Feel free to follow her on her journey on both Facebook and Instagram @APrettyPirate !! XO. Manager Maddy was born in Belleville, and has a knack for creativity and bright colours. Her greatest accomplishment is being the mother of an amazing little boy. In her free time, Maddy enjoys face and body painting on a wide range of clientele, and she also has a passion for doing hair and makeup. Here at the shop she ensures that all customers are happy and provided with hospitality from the moment they enter to the moment they leave. Born and raised in Oshawa, Courtney is a local creative who was drawn to the approachable and favorable atmosphere at TTC. When she’s not working the counter, she can be found at home engaged in one of the many graphic design projects for the shop. With an honors in Visual Merchandising, she takes pride in maintaining the many facets of display in the shop front. Courtney also adores photography, video games and going to concerts or shows.